Update 2018: The Daily Mail has picked up on the subject of Mueller's silver spoon background, so here is the link as they have lots of cool pictures of a young Mueller. Also, QAnon suggests that Mueller is playing a role creating a deliberate distraction while other swamp-draining actions are taking place in the background. So interesting! Update 2017: So now Robert Mueller is a Special Counsel putting the "fix" in against Trump who threatens the status quo. This informal post can be summarized by the fact that Mueller came from Big Money and is now protecting Big Globalist Money. Generally when I do a post like this, it's pretty easy. I just go to Muckety or nndb, expand their node and see what pies they have their thumbs into. Not so with Robert Mueller, like the Washington Times article says about him, he's kept a very low profile. I thought he'd be a good candidate for Elite status, since he seems to not know whether or not we proles deserve due process or not. Let's start with young Bob Mueller, like every American boy he goes to school at one of the most Elite prep schools in the world. I've written here about how Elite prep schools are nothing like the schools you commoners go to. In fact, Mueller went to St. Paul Academy the same time John Kerry did, a small town our Elite friends live in, eh? Like his classmate Kerry, he went to serve in Nam and then went to law school at UVA. From 1993 to 1995, Mueller worked for the Washington D.C. office of Hale & Dorr. Then he called up Eric Holder, who was then the U.S. attorney for the District of Columbia, and told Holder he wanted to be a homicide prosecutor in Holder's office. "He made it clear he didn't want to be a supervisor," Holder said. "He said he liked to try cases and that he cared about the city and this would enable him to serve both interests." Eventually, Mueller became chief of that office's homicide section, and when Holder was promoted to deputy attorney general under Janet Reno, he urged Clinton to make Mueller U.S. attorney for San Francisco. 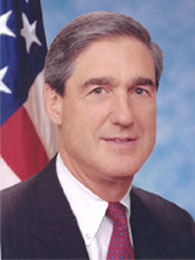 Mueller nabbed the post and served as U.S. attorney there from 1998 to 2001. Small world, isn't it? The Post goes on to say that Mueller has buddies on both sides of the aisle. Well, when when working for one big monopolistic cartel, that's pretty easy isn't it? According to the Post, he's big buds with Patrick Leahy and Barbara Boxer. His former coworker, John Pistole now spends his time giving us bs about how the TSA is keeping us safe. His strong support for law enforcement agents has occasionally led Mr. Mueller to express hostility to their critics. Associates recall his anger at members of Congress and others for criticism of the F.B.I. 's 1992 siege of a separatist family at Ruby Ridge in Idaho, where a woman, her 14-year-old son and a deputy United States marshal were killed. By then, Mr. Mueller headed the criminal division at the Justice Department. Recall that she was killed holding a baby for the crime of what? Not conforming while holding fast to the second amendment. So what is the deal with this guy? What did his parents do to be able to afford to send him to St. Pauls? How does he rocket up the ladder like he did? Why did he ask Eric Holder to work on homicide in Washington DC? His mother came from good ol' robber baron stock, her grandfather having owned the Lackawanna Railroad. His dad worked at DuPont, but I have not been able to determine how high up he was in the organization. One article said that leaving the big law firm for working on the DC homicide desk was no problem as his wife, Ann Standish had lots of cash from her trust funds. So who is this woman, and how does she come by buckets of trust fundage? According to the New York Times, his hobbies are tennis and squash. Need I say more on his Elite status? So for those of you wondering why people like me care about the details of a perfect strangers life, let me tell you the motivation behind the Meet the Elite series. It's to expose the fact that those running our country are not "We the People", but "We the Clique" holding most of the money. These people are into all sorts of bad business, but most of all they delude themselves into thinking that they are the "benevolent upper crust" as dreamed of by Plato. Ergo the term, plutocracy, which is what we've got here. Didn't they get hacked big time last Christmas? Mueller goes back to 9/11 for justification to hack our info, how very convenient for them. So now Mueller is special counsel. Guess it's no surprise that they'd never pick someone from flyover country or amongst the wretched or untouchable caste. So true Dan; with over 300 million in our country, it never ceases to amaze me how the same handful crop up again and again! It has been reported that Mueller is the gandnephew of the famous CIA man,Richard Bissell,the father of the Bay of Pigs.And his wife is a grandchild or grand niece of Charles Cabell,a deputy Director of the CIA fired after the Bay of Pigs,and Earle Cabell.Mayor of Dallas on 11/22/63 who has recently been uncovered as a CIA asset. Thanks for the interesting facts, it drives the point home! It truly is a close-knit bunch of folks who work on centralizing everything for their own gain. Wait....George W. Bush hired him. Then Obama kept him on. I'm missing your point. He's a lefty elitist? Bush and Obama work for the same team- Team Globalist. I would refer you to the book, Confessions of a Monopolist or any of the fine Antony Sutton books linked on the sidebar to understand how big money ha no party allegiance, but only the goal of socialism for the masses and the accumulation of wealth for the "elite" which comes in left and right flavors. Ex. Bush's grandfather Prescott had major dealings with the Nazis, his son Bush Sr. was in charge of the CIA at one point. Obama was born and raised in a CIA family. Check out Dreams of My Real Father by Joel Gilbert sometime-it will blow your mind!!! These sum it up pretty well.